Now, blessed child, you must know that this was the first feast made in Heaven for the Divine Will, which had worked so many prodigies in Its creature. Therefore, at my entrance into Heaven, the whole celestial Court celebrated all the beautiful and great things that the Divine Fiat can work in the creature. Since then, these feasts have never been repeated, and this is why your Mama loves, so much, that the Divine Will reign in the souls in an absolute way: to give It the field in order to let It repeat Its great prodigies and Its marvelous feasts. I said to Him: ‘My sole and only Good, how can you do this since I am so bad and full of defects and imperfections? If Charity is order, aren’t these defects and sins disorder that keeps my soul all messy and upside-down?’ And Jesus: “I will purify everything, and Charity will put everything in order. Besides, when I let a soul participate in the pains of my Passion, there cannot be grave sins; at most, some venial involuntary defects, but my love, being fire, will consume everything that is imperfect in your soul.” So it seemed that Jesus purified me and ordered all of me; then He poured as though a rivulet of honey from His Heart into mine, and with that honey He watered all of my interior, in such a way that everything that was in me remained orderly, united and with the mark of Charity. After this, I felt I was going out of myself into the vault of the heavens, together with my loving Jesus. It seemed that everything was in feast – Heaven, earth and Purgatory. All were inundated with a new joy and jubilation. Many souls were going out of Purgatory and, like bolts of lightning, reached Heaven in order to be present at the feast of our Queen Mama. I too pushed myself through that immense crowd of people – Angels, Saints and souls from Purgatory which already occupied that new Heaven. It was so immense, that the heavens that we see, compared to that one, seemed a little hole to me; more so, since I had the obedience of the confessor. But as I went about looking, I could see nothing but a most refulgent Sun spreading Its rays, which penetrated through me, in such a way as to make me become like crystal; so much so, that my little spots appeared very clearly, as well as the infinite distance that exists between Creator and creature. More so, since each one of those rays had its imprint: some delineated the sanctity of God, some the purity, some the power, some the wisdom, and all the other virtues and attributes of God. So, in seeing her nothingness, her miseries and her poverty, the soul would feel annihilated, and instead of looking, she would fall down, her face to the ground, before that Eternal Sun which no one can face. So, we recited the first part of the ‘Hail Mary’ together. Oh, how tender and moving it was to hail our Most Holy Mama together with Her beloved Son! Each word He said carried an immense light, through which one could comprehend many things about the Most Holy Virgin. But who can say them all – especially because of my inability? Therefore I let them pass in silence. All created things walk toward man. The Feast of the Assumption should be called Feast of the Divine Will. I continued to fuse myself in the Holy Divine Will in order to give to my Jesus the return of my little love for all that He has done for mankind in Creation; and my beloved Jesus, moving in my interior, in order to give more value to my little love, did what I was doing together with me. Then He told me: “My daughter, all created things were made for man, and all of them run toward man. They have no feet, but they all walk; they all have motion, in order to find him and to be found. The light of the Sun starts from the height of the heavens in order to find the creature, illumine her and warm her. The water walks, to reach even into the human bowels, to quench her thirst and to refresh her. The plant, the seed, walks – opens the earth and forms its fruit to give itself to man… There is not one created thing that does not have a step, a motion, toward the one to whom the Eternal Maker had directed it in its creation. My Will, that walks continuously toward the creature in created things, never stops. It is all motion toward the one whom It loves so much. Yet, who says a “Thank you” to my Will, that brings her the light of the Sun to illumine her, the water that can be drunk to quench her thirst, the bread to satisfy her hunger, the flower and the fruit to cheer her, and many other things to make her happy? Would it not be fair that, since my Will does everything for man, man would do everything to do my Will? Oh, if you knew the feast that my Will makes in created things, when It walks toward one who does my Will! My Will, operating and fulfilled in the creature, and my Will operating in created things, kiss as they meet, harmonize, love each other, and form the hymn of adoration to their Creator and the greatest portent of all Creation. Created things feel honored when they serve a creature who is animated by that same Will which forms their own lives. After this, I began to think of the feast of my Celestial Mama Assumed into Heaven, and my sweet Jesus, with a tender and moving tone, added: “My daughter, the true name of this Feast should be Feast of the Divine Will. It was the human will that closed Heaven, broke the bonds with its Creator, made miseries and suffering enter the field, and put an and to the feast that the creature was to enjoy in Heaven. Now, this Creature, Queen of all, by doing the Will of the Eternal One, always and in everything – even more, it can be said that Her life was Divine Will alone – opened the Heavens, bound Herself to the Eternal One, and restored in Heaven the feasts with the creature. Every act She did in the Supreme Will, was a feast that She started in Heaven; it was Suns that She formed to adorn this feast; it was melodies that She sent to delight the Celestial Jerusalem. So, it is my Will that was and is celebrated more than everything on the day of Her Assumption into Heaven. It was my Will alone that made my Most Holy Mother ascend so high as to distinguish Her among all. Everything else would have been as nothing, had She not possessed the prodigy of my Will. It was my Will that gave Her Divine Fecundity and made of Her the Mother of the Word. It was my Will that made Her see and embrace all creatures together, making of Her the Mother of all, and loving all with a love of Divine Maternity. Constituting Her Queen of all, It made Her rule and dominate. On that day, my Will received the first honors, the glory and the abundant fruit of Its work in Creation; and the unending feast began, for the glorification of Its work in my beloved Mama. 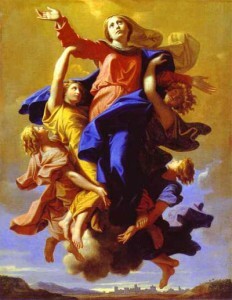 And even though Heaven was opened by Me, and many Saints already possessed the Celestial Fatherland when the Celestial Queen was assumed into Heaven – we waited for Her who had honored It so much and contained the true prodigy of the Most Holy Will, to make the first feast for the Supreme Volition, because She Herself was the primary cause of it, having fulfilled the Supreme Will in everything. Living in the Divine Fiat is communism between Creator and creature. The Virgin: Her insuperable glory. The Sanctity of the Divine Will known in Heaven. After this, I was thinking about and accompanying the Sovereign Queen when She was assumed into Heaven; and my sweet Jesus, moving in my interior, as though singing the praises of His Celestial Mother, told me: “My daughter, the glory of the Mama of Heaven is insuperable. No one else in the celestial regions possesses seas of graces, of light, seas of beauty and of sanctity, seas of power, of science and of love; and what is more, She possesses these seas within the endless sea of Her Creator. The other inhabitants of the blessed fatherland possess, at most, some little rivulets, some little drops, some little fountains. She is the only one, because She alone lived life in the Divine Fiat. The human volition never took place in Her – Her life was all of Divine Will; and by virtue of It, She centralized all creatures within Herself, conceiving them in Her maternal Heart, and bilocating Her Son Jesus as many times, to give Him to each creature whom She had conceived within Her virginal Heart. This is why Her Maternity is extended to all, and all can boast and say: ‘The Mother of Jesus is my Mother, and this Mother so sweet, lovable and loving, gives Her beloved Son to each of us as a pledge of Her maternal love.’ Only my Will could give Her this virtue of conceiving all creatures as Her children, and of multiplying Her Jesus for as many children as She had. The feast of Assumption is the most beautiful, the most sublime feast. It is the feast of the Divine Will operating in the Heavenly Queen. While my mind was swimming in the sea of the Divine Will, I stopped at the act in which my Mother and Queen was assumed into Heaven. How many wonders, how many enrapturing surprises of love. And my sweet Jesus, as if He felt the need to speak about His Celestial Mother, all festive told me: “My blessed daughter, today is the feast of Assumption. This is the most beautiful, the most sublime, the greatest feast, in which we remain glorified, loved and honored the most! Heaven and earth are invested with an unusual joy, never before felt. The Angels and the Saints feel as if invested with new joys and new happiness, and they all praise with new songs the Sovereign Queen who, in her empire, rules over all, giving joy to all! Today is the feast of feasts – the unique one, the new one, which was never repeated again. Today, the day of the Assumption, celebrated for the first time the Divine Will operating in the Sovereign Queen and Lady; the marvels are enchanting in each of her smallest acts, even in her breathing, in her motion. Many of our divine lives can be seen flowing in her act as many Kings which, more than bright Suns, inundate – surround and embellish her – making her so beautiful as to form the enchantment of the Celestial Regions. Do you think it’s nothing, that each one of her breaths, motions, works and pains were filled with many of our divine lives? This is exactly the great prodigy of my Will operating in the creature: to form a divine life for each time It could enter the motion and the acts of the creature. Then, since my Fiat possesses the virtue of bilocation and repetition – doing again and again without ceasing everything she does – so the Great Lady feels these divine lives multiplied within herself, which do nothing other than further extend her seas of love, beauty, power and infinite Wisdom! You must know that the divine lives she possesses are so great and so many that, upon entering Heaven, they crowded the whole Celestial Region and, being impossible to contain them, they filled the whole Creation as well. Therefore, there is no place where her seas of love and power do not flow, along with the many of Our Lives of which She is possessor and Queen. We can say that she dominates Us and that We dominate her. By clothing herself with our immensity, power and love, she populated all our Attributes with her acts and with the many of our divine Lives which she had conquered! Therefore, from every place and everywhere, we feel ourselves being loved and glorified – inside and outside of ourselves, from within all created things, in the most remote hiding places – by this Celestial Creature and by those same divine lives which our Fiat formed in Her. Oh! Power of our Will, only You can do such prodigies to make us loved and glorified as we deserve and want – to the extent of creating many of our lives in the one who lets You dominate. This is why She can give Her God to all, because She possesses Him. Even more, when She sees a creature disposed to receive our Will, without losing one of our Divine Lives, She has the virtue of reproducing, from within these divine Lives which She possesses, yet another of our Divine Lives to give to whomever she wants.